Mr. Football. It was a missile fired directly into Brown’s massive heart. It transformed Brown’s best asset, folksiness, into softness. It spoke to a certain lack of edge. In 1989, Spurrier beat Brown’s Tar Heels 41-0 in Chapel Hill. The Blue Devils stayed on the field and took a picture in front of the scoreboard. Mr. Football retired — well, resigned — as Texas coach Saturday. The 158 games he won in Austin are remarkable. For, as Spurrier noted, Mack Brown suffered from a condition that never affected Nick Saban or Urban Meyer or any other great coach. Brown, in some deep part of his soul, was afraid of college football. This made him an unbelievably frustrating guy to root for. It also made him the coach I’ll love more than any other. See, Mack was my coach. He was hired my sophomore year at Texas. I think I first laid eyes on him — memories of this period are from the inside of a Shiner bottle — in the spring of 1998. There was a scholarship dinner for those of us who needed money to attend a state school. “Mack Brown!” someone yelled, and Brown materialized from behind a curtain. Or maybe it was a just door. Anyway. Voilà. I don’t remember his remarks. I’m fairly sure they included the catchphrase that was about to sweep campus: “Come early, be loud, stay late, wear orange.” If you were a student at Texas between 1971 and 1997, none of those were givens. Texas was pretty lousy at football. The previous year, John Mackovic had lost a home game to UCLA 66-3. I was at that game. It was really hot. I was really happy when Mackovic was fired. William Mack Brown was a vagabond even by college football standards. He was born in Tennessee to a sports-mad family. Brown remembered his grandmother saying, “Enjoy sports, but don’t get consumed with sports like your dad and grandfather.” Brown played running back at Vanderbilt and Florida State until five knee operations knocked him out of football. Spurrier, meanwhile, won the Heisman as a quarterback at Florida. He was a sensei of persuasion. Brown brought Darrell Royal, the dean of Texas football coaches, back into the program after years of alienation. He convinced Ricky Williams to stay for his senior year. He recruited Chris Simms, Roy Williams, Cedric Benson. (“He could talk me into eating a ketchup Popsicle,” one recruit said.) Brown’s pitch was an old-fashioned, quaint kind of courting. In those years, even five-star recruits couldn’t get a scholarship offer from Texas over the phone. They had to go into Brown’s office in Austin, look the coach in the eye, and receive it in person. UT had acquired a face: the welcoming mien of Mr. Football. Spring practices were open to adults, children, and spies from Big 12 rivals. (A pleasant staffer once handed me a roster as I walked in.) The NFL draft was one of Brown’s favorite events, a chance to declare that the boys who’d come to him had passed into adulthood. In 1998, Brown said that if anything happened to him, he wanted Greg Ellis, a defensive end he’d coached at North Carolina, to adopt his kids. In 1999, Oklahoma hired Bob Stoops, Spurrier’s defensive coordinator. 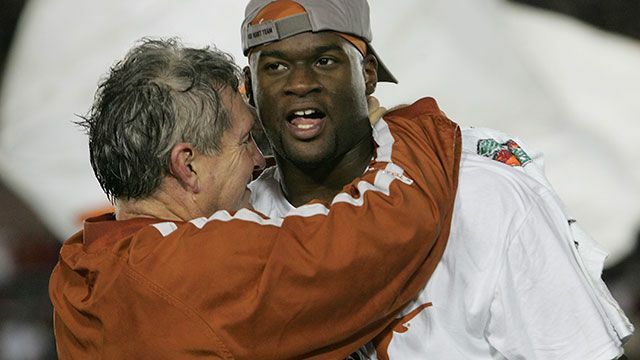 Next to Vince Young, Stoops proved to be the most important person in Brown’s tenure at Texas. In 2000, Oklahoma beat Texas 63-14. The next year, it was 14-3 (a game famous for Roy Williams’s leap over the offensive line and into Chris Simms). In 2003, it was 65-13. And then 12-0 in 2004. I was at the latter game, as a returning alum, sitting in the end zone. I remember wandering the fairgrounds afterward in a daze, before setting eyes on an OU fan with Oakley sunglasses and a handlebar mustache. He was wearing a T-shirt that read “Texas Is Gay.” I also remember — again, recollections via Shiner — Greg Robinson, Brown’s defensive coordinator, running up to Brown and screaming at him after the game. We’d held Adrian Peterson and the sitting Heisman winner, Jason White, to 12 points. Yet somehow we lost. The Brown regime had football problems. Early in 2004, they hadn’t figured out how to use Vince Young. They showed up for OU with a game plan befitting North Texas, rather than the most talented team in the country. But the most potent critique was still Spurrier’s. Brown was hesitant — afraid, even — to do the dirty business of coaching. Brown didn’t like to oversign players. Oversigning is when you promise 30 unpaid jobs, but give out only 25 and tell the remaining kids tough luck. I can’t say Brown never did this. (I know one scholarship offer that turned into a “grayshirt” — essentially, a delayed scholarship.) But I bet Brown’s number of oversignees was closer to zero than Nick Saban’s is to 20. Brown hesitated to cut players. Cutting — a byproduct of oversigning — is when you hint to your unpaid workers that they should get lost. I can’t say for certain that Brown didn’t cut players. But, again, I bet his number was closer to zero than Saban’s is to 20. The point isn’t that Brown was morally superior. (Though he would happily take the compliment.) The point is that Brown was playing a different game than most coaches. Even Darrell Royal’s Texas teams endured such nasty drills, such medieval medical practices, that one player was moved to write a muckraking book. No one would write such a book about Brown. He was nice. Some said too nice. The 2006 National Championship. The Rose Bowl. I was there, too. I bought my ticket from a scalper for $1,250. If I’d known how Vince Young was going to play, I gladly would’ve paid double. That team was perfectly constructed for Brown’s persona. Brown had used his awesome Mr. Football persuasive powers to lure Young to Austin. What Young did, to Brown’s surprise, was instill ruthlessness in the program. I don’t want to make too much of psychology: Young was great because he ran to the end zone and no one could catch him. But when he came back from the Heisman ceremony that year embarrassed that he’d lost to Reggie Bush, I thought, He’s going to beat USC by himself. I could bore you to tears about Texas 41, USC 38. I’ll only make you hear about two moments. One was the wonderfully dumbfounded look on Brown’s face when the final gun went off: We won? It was the look on my face, too. And, second, Brown’s speech in the locker room after the game. Among the first orders of business was thanking the celebrities who stood on the Texas sideline: Matthew McConaughey, Lance Armstrong. This is Mr. Football. No celebrity goes unacknowledged. Then Young, who’d piled up 467 yards, started chanting something, and the players started chanting with him. Brown spoke again. “I don’t want this to be the best thing that ever happened in your life,” he said. Every word said in a winner’s locker room is a cliché. But it’s a particular kind of cliché: One about pulling together or having each other’s backs or overcoming adversity to become a champion. Mr. Football chose a different cliché. Football is not life. Brown called the player to straighten things out. Again, there were football problems. Texas failed to sign Johnny Manziel, RG3, Andrew Luck … Brown refused to fire his defensive coordinator, Manny Diaz, before the start of the 2013 season. Diaz was fired after two games. But as we talked last summer, Brown seemed more perturbed about the loss of civility around his job. In 2011, Texas and ESPN had created the Longhorn Network. It was a sort of new-media coup. But Art Briles told Brown that Baylor coaches could now watch UT practices in Waco. This blew Brown’s mind, and he later said that when a Texas player tweaked his ankle, Texas trainers, as a matter of policy, taped both ankles before the player ran in front of the cameras. Just in case Briles was tuning in. Message boards terrified Brown. A recruit would come to Brown’s office to receive his scholarship offer. Seconds after the recruit would leave, Brown would hear the recruit’s phone ring, and then the voice of a recruiting reporter trying to pump intel out of the kid. This made Brown uncomfortable — he was so friendly he wanted to broker that interaction, too. To my astonishment, Brown told me about another Mr. Football. A man posing as “Mack Brown” was calling recruits around the state. Someone is impersonating you? I asked. It wasn’t just the media that was eating Mr. Football. It was the state of football itself. Brown was afraid of the new wave of “street agents” who were brokering scholarships for recruits. It wasn’t just the money, or the fact that Texas was losing players to Oregon. Brown said he was concerned that players were getting wrapped up with folks of ill repute. He sounded genuine. Brown told me he thought college players ought to be paid. He expected it to happen — naively, it seems now — before he finished coaching. I’ll never forget the day I left Vietnam. Everybody was so quiet it seems surreal. The plane rose above the clouds and almost in a whisper somebody said “I can’t believe it; we’re really getting out of this.” I think I’ll have déjà vu when I finally hear the announcement that Mack Brown is leaving Austin. That was the ambient noise as Brown and I sat in his office and the pictures of the people he loved refreshed again and again and again. Texas-OU. This October. When Texas opened as a 14-point underdog, the merry pranksters at the site Barking Carnival prepared Mack’s pre-apology for the loss. It was going to be bad. I flew to Dallas because I wanted to see Mack Brown’s last OU game. Texas-OU is played in the Cotton Bowl, which is surrounded by the frayed–seat belt carnie rides and two-headed snake attractions of the State Fair of Texas. Minutes before kickoff, the Texas half of the stadium was only about 40 percent full. The game was a sellout, but our people were hiding in the fair. It was a weird day meteorologically, too. The Cotton Bowl would be covered in scorching sunlight one minute and gloomy shade the next — it was the Mack Brown era as a cloud formation. Texas just pushed Oklahoma around. (Keep Bob!) I screamed from the upper deck, boy did I scream, as I wore the same dumbfounded look I did at the Rose Bowl. We beat OU? Greg Robinson — the same guy who’d yelled at Brown in 2004 — said, “I wouldn’t be here if it wasn’t for Mack Brown. I just wanted to come help him, because he’s that kind of guy. I think our players feel the same way and I think our coaches feel the same way. Brown’s demise was the stuff of his nightmares. It began last Tuesday with a report from OrangeBloods.com, one of those dastardly websites, saying he was resigning. Brown sent an angry text denying it; he said he was busy selling ketchup Popsicles to recruits. Then a picture surfaced of Brown on the recruiting trail, in a familiar pose: arms crossed above his belly. That one hit me hard. It’s one of the last pictures we’ll ever see of Brown being a football coach. The next Texas coach — Briles, Gus Malzahn — will seek to undo a lot of what my coach has done. This is by design. For our collective sanity, it’s a good idea. I hope we’ll never again go into the OU game like the Army’s Seventh Cavalry Regiment at Little Bighorn. We won’t sit on the biggest cache of high school spread quarterbacks in human history and let Baylor and A&M pick off all the good ones. But take a look at Brown’s old antagonist, Steve Spurrier. This year, in his bid to be a model college football coach, Spurrier tried to shame Jadeveon Clowney into playing hurt. I don’t mean to pick on Spurrier — well, actually, I do. Because we see why his critique of Brown was skewed. College football coaching is a crackpot profession. It rewards moral treachery if not outright cruelty. If Mack Brown has a boast, it’s that he did the job with insufficient gusto. He coached the game but never bent to its demands on his soul. He was Mr. Football. Starting today, it’s a compliment.